Synthesis of Gold nanoparticles has gained interest of many researchers in the field of application research. A number of chemical and physical methods for the synthesis of Nanoparticles have been used traditionally. But, owing to the disadvantages these methods have, there has been a shift from physical and chemical methods to the biological methods involving various strains of microorganisms. This has been proved a promising approach as the nanoparticles produce are cost and energy-efficient manner; also they are non-toxic and can be used in the clinical fields as well. There are certain enzymes present in a few microorganisms like Yeast, Algae, Bacteria, Fungi, etc. which reduces the Au+ ion to its corresponding nanoparticles. This paper provides a brief overview of the biosynthesis of Gold Nanoparticles using various microorganisms. This includes the methods used and discussion about the shortcomings as well as the future prospects of using Gold colloids in various medical fields. The toxicity aspect which is the grave concern related to metal nanoparticles worldwide has also been covered so as to provide the readers with valuable information regarding nanoparticles synthesis and applications. Gold nanoparticles; Microorganisms; Toxicity; BioNanotechnology; Bacteria; Yeast; Fungi; Algae. A Nanoparticle is composed of atoms in either a singleor poly-crystalline arrangement having at least one dimension smaller than 100 nanometers. Nanoparticles have pulled in a huge consideration due to their interesting properties, be it be Thermal, Optical, Chemical, Physical properties which are due because of the blend of a huge extent of high energy surface molecules in comparison to the bulk solid. Nanoparticles of a variety of shapes, sizes, chemical compositions and controlled monodispersity are being synthesized for a long time now using the traditional physical, biological, chemical and a mixture of these methods. Of these, Chemical and Physical methods extensively utilize toxic chemicals which enormously restrict their use in the biomedical fields specifically in the clinical fields. Moreover, these methods are capital-intensive and inefficiently use energy and materials. Thus, a need for dependable, environment- friendly, nontoxic strategies for the formation of NPs was felt in order to extend its applications in many fields. One of the alternatives to accomplish this task was to use microorganisms to form NPs. We are aware that microorganisms, whether unicellular or multicellular can synthesize inorganic products both intra-cellularly and extracellularly. So, the biosynthesis of NPs is the recent BioNanotechnology (amalgamation of Biotechnology and Nanotechnology) and has gotten impressive consideration because of the need to develop methods for eco-friendly synthesis of Nanoparticles. Biosynthesis of NPs from microorganisms including Fungi, Algae, Bacteria, etc. is an example of a bottom up approach in which Redox reactions leads to the formation of colloids. Enzymes present in microorganisms have reducing nature which reduces the metal ions into their corresponding Nanoparticle . Nanoparticles are synthesized when microorganisms seize ions from their surroundings and then transform them into the corresponding metal with the help of enzymes produced by their cellular metabolism. It can be arranged into Intracellular (which involves conveying the ions inside the microbial cell in order to form NPs within the sight of enzymes) and Extracellular (which involves confining the ions on the cell surface thus reducing the ions in the presence of enzymes) based on the area where the NPs are formed. Bacillus subtilis  as well as Thiobacillus ferroxidans are capable of performing intra-cellular reduction of Au3+ to its corresponding gold Nanoparticle whereas Pseudomonas aeruginosa ATCC 90271 can form NPs extra-cellularly . Gold has been a topic of interest for many researchers since the ancient times. Gold has majorly won interests of people especially in the field of nanoscience and nanotechnology as Gold NPs or Gold colloids. Out of all the metal NPs, AuNPs are considered as the most stable. They present to us few fascinating optical, magnetic and physical properties and its applications in the field of biology. For an instance, Beveridge and colleagues have shown that nanoscale gold particles might be promptly expedited inside the cells of the bacteria incubation of the cells with Au3+ ions [4-6]. Earlier, Gold NPs were used for the recoloring of glasses for embellishing purpose. The cutting edge period of the formation of AuNPs started over 150 years ago when Faraday, who was potentially the first to watch that colloidal gold arrangements have properties that contrast from mass gold. 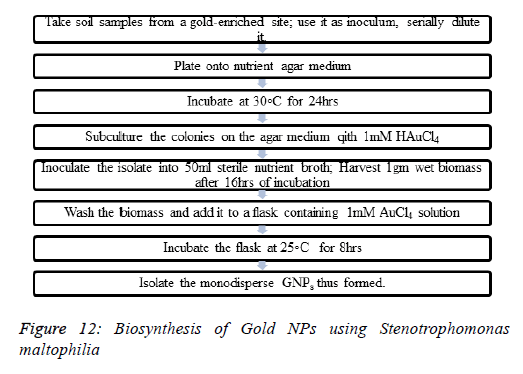 The biosynthesis of Gold NPs is the recent BioNanotechnology field (combination of Biotechnology and Nanotechnology) (Table 1). Fusarium oxysporum  and actinomycete Thermomonospora sp, etc. are seen to carry extracellular synthesis of gold NP and fungus Verticillium sp. were seen to carry intracellular synthesis by Sastry and coworkers . Table 1: Depicts typical properties of Gold Nanoparticles. According to an observation by Southam and Beveridge, incubation of the cells with Au3+ ions may lead to the precipitation of gold particles of nanoscale dimensions inside the bacterial cells . Alkalotolerant Rhodococcus sp. are also seen to form monodisperse gold NPs under harsh environmental conditions . Many other microorganisms produce NPs of different shapes. For example, Rhodopseudomonas capsulate and Shewanella oneidensis form spherical gold NPs . Escherichia coli and Yarrowia lipolytica  forms triangular gold NPs; Plectonema boryanum forms cubical NPs, etc. Silver NPs are proved to be effective against a wide range of microbes. This property has led to their exploitation in the field of nanomaterial. Microbes are responsible for the reduction of Ag+ to its silver nanoparticles, which are majorly spherical in shape [7,13,10]. It has been shown by Klaus and coworkers that when Pseudomonas stutzeri AG259 is placed in a concentrated aqueous solution of silver nitrate, it formed Ag nanoparticles after reducing Ag+ .Also, a film of AgNP was formed on the surface of the cells of fungi, Verticillium, Fusarium oxysporum, or Aspergillus flavus  etc. Organisms like Bacillus cereus, Aspergillus flavus, Aspergillus fumigatus, Fusarium oxysporum, Neurospora crassa , Trichoderma viridae, etc, produces Spherical silver NPs; Corynebacterium glutamicum produces irregular silver NPs [17-20]. They are a novel type of NPs which have their applications in the field of catalysis, electronics, as optical materials, and coatings. F. oxysporum was studied to form the bimetallic Au- Ag alloy NP and enlightened the role of NADH in telling the composition of Au-Ag alloy nanoparticles .Through TEM and Fluorescence microscopic studies, it has been observed that these Au-Ag NPs are majorly formed extra-cellularly and were polygonal in shape. Stability of Au-Ag NPs was studied in Fusarium semitectum by Sawle et al. Biosynthesis is based on the fact that biological species and inorganic molecules interact constantly. This portion of paper will discuss about the types of Metallic NPs and the methods used to synthesize them. Fungi have the potential to secrete various secondary metabolites and enzymes that are dealt in the laboratory. Fungi are known to have the capability to secrete large amount of enzymes and they also have high tolerance level towards metals . Fungi also take up the metals intra-cellularly. The most commonly used group of fungi for the biosynthesis of gold NP- Actinomycetes (because they are an intermediate to both the prokaryotes and fungi). Using Rhodococcus sp. : Rhodococcus sp. are an example of alkalotolerant actinomycetes fungi shows an optimum growth at 27℃ and pH=7. These forms GNPs intracellularly i.e within the actinomycete cells, on the cytoplasmic membrane. Rhodococcus sp. after exposure to AuCl4- ions causes fast reduction of the gold ions which leads to the formation of GNPs with a high level of monodispersity (Figures 1-3). Figure 1. 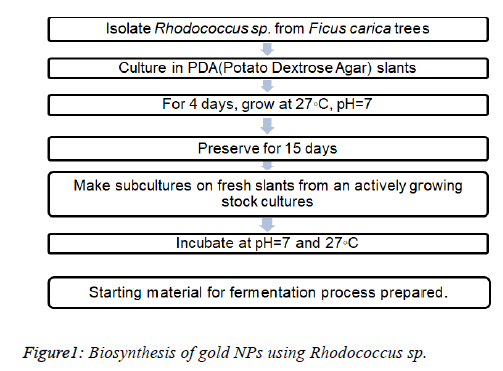 Biosynthesis of gold NPs using Rhodococcus sp. Figure 2. 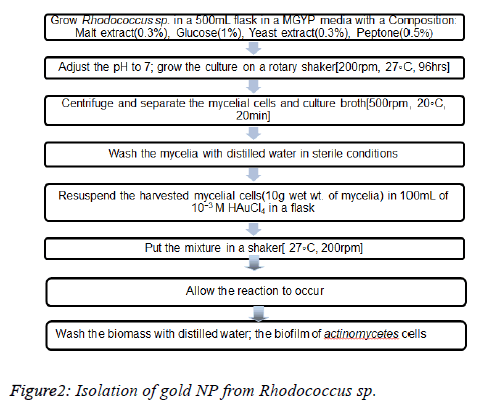 Isolation of gold NP from Rhodococcus sp. Figure 3. (A). Rhodococcus sp. actinomycete cells after exposure to 10−3 M aqueous solution HAuCl4 for 24 h. (B) Rhodococcus sp. biomass after removal from the culture medium (Rajiv Kumar, et al.). The samples of aliquots (2ml) of the aqueous components were simultaneously checked for their biotransformation with the help of UV-Vis spectra. TEM studies on the finely sliced sections of AuNP-Actinomycete cells were carried out in order to know about the exact location of the reduction of AuNP . Using Thermomonospora sp. : Thermomonospora sp. is an example of extremophiles (which can survive under extreme conditions that are proved to be fatal to humans). They owe their survival to certain adaptations such as new mechanisms of transduction, maintaining the structure and function of membrane and enzyme, regulating the metabolism of the body, etc. They grow optimally at pH 9 and a temperature of 50°C (Figures 4 and 5). Figure 4. Isolation from Thermomonospora sp. Figure 5. 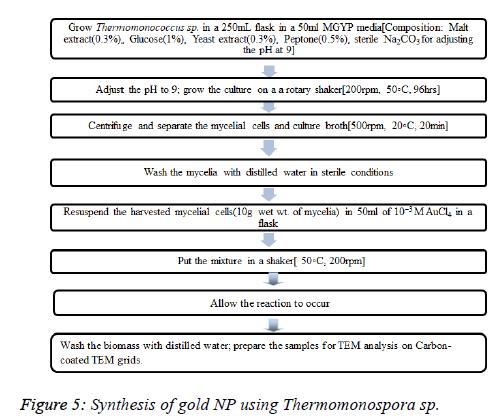 Synthesis of gold NP using Thermomonospora sp. Exposure of Thermomonospora sp. to the gold particles reduces them into gold ions that form the gold NPs extracellularly. An advantage of using Thermomonospoara sp. : They produce NPs with much better polydispersity, a factor which is highly important for determining the quality of NP produced. The samples of aliquots (2 ml) of the aqueous components were simultaneously checked for their biotransformation with the help of UV-Vis spectra. TEM studies on the finely sliced sections of AuNP-Actinomycete cells were carried out in order to know about the exact location of the reduction of AuNP. Using an Endophytic Fungi: Endophtic fungi to be used were isolated from medicinal plant . This class of fungi has not been used too frequently for the biosynthesis of Nanoparticles until sometime back . The fungal isolated used were called GX2, GX3 and ARA which used HAuCl4- as the starting material. They were grown under aerobic conditions in a nutrient broth with the following composition: malt extracts powder, glucose, yeast extract and peptone. The culture was then incubated at 27℃ and the supernatant was obtained after 7 days. Incubate 10 ml of culture along with 20 ml HAuCl4 under dark conditions for 48 h at room temperature. The Nanoparticles thus formed were confirmed after an observation of a change in the color from pale yellow to pink. The culture was then centrifuged at 5000 rpm for 15 min and then grounded with KBr and made into the pellets. The color change was because of the aggregate coherent oscillation of the conduction electrons at the outer surface of the GNP when these particles cooperate with the wavering electric field of the incident light. This process is known as- “surface plasmon resonance (SPR)”. This color change is considered as the proof of the successful completion of the first step in the biosynthesis of GNPs. Using C. albicans: HAuCl4 (Chloroauric acid), horseradish peroxidase-conjugated antirabbit IgG, 3,3′- diaminobenzidine tetrahydrochloride, Tween 20 and diethyl nitrosamine are required as chemicals. The cytosolic extract was isolated from C. albicans [culture the cells on YEDP agar plates harvest and homogenize the cell after 24 h in a protease inhibitor cocktail sonicate and then vortex the homogenate with subsequent cooling pellet it out and collect the supernatant]. Take different volumes of the cytosolic extract and add it to 5 mL solution of 10−3 M aqueous HAuCl4. Make the volume up to 10ml. Incubate for 24 h until the reaction is completed. 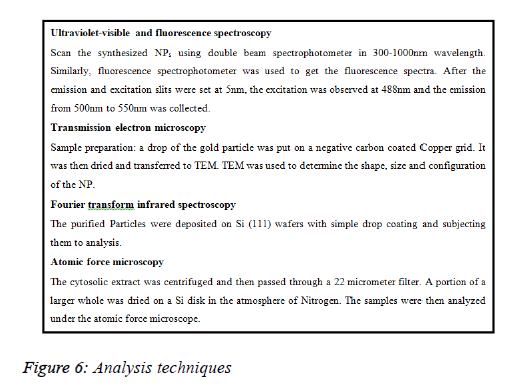 The gold NP thus formed was identified by ultraviolet-visible spectroscopy; transmission electron microscopy, atomic force microscopy, and Fourier transform infrared analyses (Figure 6). Using Sargassum wightii Greville, a marine alga: Sargassum wightii is the first ever alga to have produce very stable gold NP. The stability of the NP produced makes this alga an agile candidate for the NP production (Figure 7). Using Pseudomonas aeruginosa: For the study, two strains of Pseudomonas aeruginosa were taken and cultured in nutrient broths and agar plates [25,26]. The first strain-1 produces pyoverdin, a soluble fluorescent pigment and the other strain-2 produces pyocyanin, a blue pigment after being cultured on agar media. Standard strain of P. aeruginosa ATCC 90271 was used too. Grow the bacteria in a 50 mL nutrient broth under aerobic conditions, Incubate at 37℃ and agitate at 150 rpm for 24 h, Obtain the supernatant by centrifugation at 5000 rpm, 5 min (Figures 8 and 9). Figure 8. 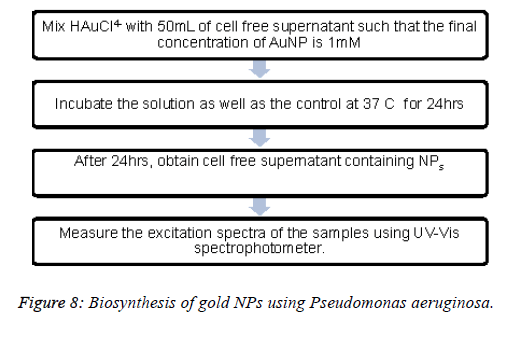 Biosynthesis of gold NPs using Pseudomonas aeruginosa. Figure 9. 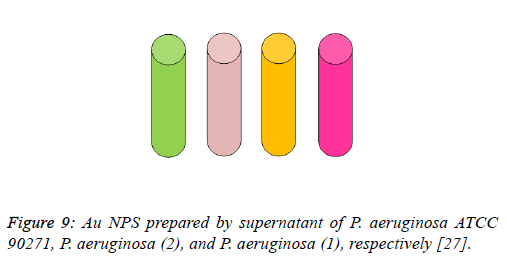 Au NPS prepared by supernatant of P. aeruginosa ATCC 90271, P. aeruginosa (2), and P. aeruginosa (1), respectively . Using Pseudomonas denitrificans: Pseudomonas denitrificans is a gram negative bacterium which carries out the process of denitrification. This reducing property of Pseudomonas denitrificans is exploited by researchers to produce GNPs (Figure 10). Figure 10. 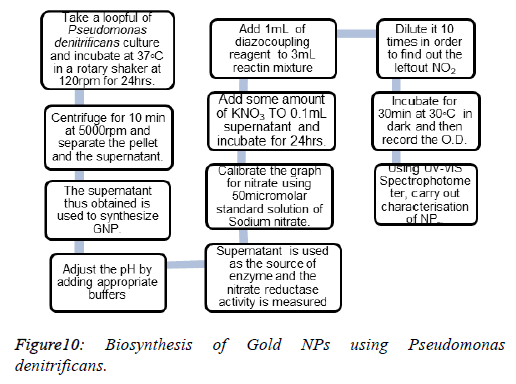 Biosynthesis of Gold NPs using Pseudomonas denitrificans. Using Stenotrophomonas maltophilia: In Stenotrophomonas maltophilia, the conversion of Au3+ to Au0 is mediated by a NADPH-dependent reductase enzyme through a metal reduction process. Incubate the biomass with different concentrations of NADPH and examine the change in the color with the help of a spectrophotometer. A control was simultaneously run and no change in its color of suspension was observed. The increase in the intensity of the color of the suspension confirmed the formation of GNPs. Therefore, it was analyzed that biomass and NADPH, both, are essential for the formation of GNPs (Figures 11-13). Figure 11. 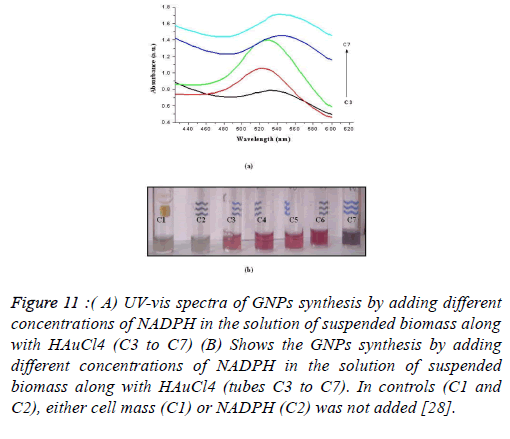 ( A) UV-vis spectra of GNPs synthesis by adding different concentrations of NADPH in the solution of suspended biomass along with HAuCl4 (C3 to C7) (B) Shows the GNPs synthesis by adding different concentrations of NADPH in the solution of suspended biomass along with HAuCl4 (tubes C3 to C7). In controls (C1 and C2), either cell mass (C1) or NADPH (C2) was not added . Figure 13. 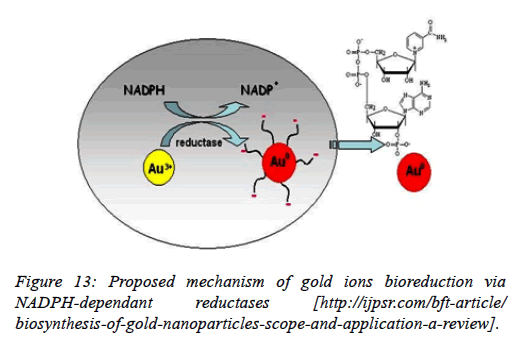 Proposed mechanism of gold ions bioreduction via NADPH-dependant reductases [http://ijpsr.com/bft-article/ biosynthesis-of-gold-nanoparticles-scope-and-application-a-review]. Despite the fact that the upsides of microorganisms intervened biosynthesis of metal nanoparticles there are as yet many difficulties to be overcome before it can be applied for all intents and purposes. One of the critical test is the under a given set of biosynthetic conditions control of size, shape and crystallinity of metal nanoparticles in which the real biosynthesis process is not completely caught on. The assorted qualities of microorganisms make singular filtration and assurance of different biocompounds a challenging assignment. Convention for the biosynthesis of metallic nanoparticles may vary enormously among various organisms. So it is critical to have superior information of the synthesis procedure by various microbial frameworks. Moreover the connection of a few particles from microbial biomass on to the surface of biosynthesised nanoparticles they firmly tie with the functional groups that could eventually restrain the resulting functionalization of the nanoparticles. The strength of nanoparticle is another issue to consider. It is an essential part of the nanoparticles when they are synthesized to shape a stable amid storage and have no noteworthy changes of the morphology before they are utilized as a part of handy applications. Moreover harmfulness (toxicity) assessment and furthermore natural effect of these metal nanoparticles are additionally essential angles to be considered. The valuable metals having a financial significance in human utilization are likewise appropriate in nature . As an anti-biotic, anti-fungal, and anti-microbial agent when included plastics, coatings, nanofibers and textiles. In different sensors, e.g. colorimetric sensor with gold nanoparticles can distinguish if foods are suitable for utilization. To make pacemaker and gold plated stents . For delivery of drug molecules into cells . Past the wide usage of the test conditions and the substantial disparity of an extensive piece of published outcomes, the general feeling is that stripped AuNPs are significantly dangerous both in vitro and in vivo, while proper covering may halfway keep their destructive effects . Toxicity is dependent on the following factors: i) surface chemistry, ii) coating materials, iii) size, iv) shape, and v) biological target tested . The harmfulness of nanoparticles is generally expressed as the particle concentration causing 50% of the growth inhibition in cell culture (IC50). AuNPs are known to be an excellent carrier in the field of molecular biology owing to their needle-like penetrating properties and their small size . There are various routes of NP exposure: during growth, formation and application by directly injecting or ingesting [33,34], from composites of AuNP bound to consumer products, absorption through skin touch, inhalation or even by release during time the time of implants[35,36]. Some GNPs cause toxicity because of their large surface area to volume ratio and some because of the presence of coated surface ligands. It has been studied that smaller the size of AuNP, the more it causes the toxicity and the more it binds to the cellular surfaces. The study advocated the use of Microorganisms (Algae, Fungi, and Bacteria) as an alternative of various other physical and chemical procedures for the biosynthesis of Gold Nanoparticles. The enzymes produced by various microorganisms through their metabolic activities acts as reducing agents which act as reducing agents reducing the gold ions to their corresponding Gold Colloids of different shapes, sizes and compositions. Because of this property, no external reducing agent is required which makes the GNPs thus formed safer to be used in clinical fields. Moreover, the proteins synthesized by microorganisms stabilize the NPs which is an added advantage.These organisms may form NPs either intracellularly or extracellularly. NPs obtained through extracellular synthesis are more pure as they are devoid of any cellular protein and their isolation is also easier by the filtration process of cell-free filtrate. The formation of nanoparticles has many points of interest, for example, ease with which the procedure can be scaled up, monetary suitability, probability of effortlessly covering huge surfaces by appropriate development of the mycelia, and so forth. Contrasted with the bacterial fermentations, Contrasted with bacterial maturations, in which the procedure innovation includes the utilization of advanced equipments for getting clear filtrates from the colloidal stocks, fungal stocks can be effortlessly separated by filter press of comparative basic equipments, in this way sparing significant speculation costs for equipments. The characteristic of high amounts of protein formation, other than their eukaryotic nature has made fungi as most loved hosts for heterologous articulation of high-esteem mammalian protein for assembling by fermentation. Further, contrasted with microscopic organisms; fungi and actinomycetes are known to emit considerably higher measures of proteins, subsequently essentially expanding the profitability of this biosynthetic approach. Mukherjee P, Ahmad A, Mandal D, Senapati S, Sainkar SR, Khan MI, Ramani R, Parischa R, Ajayakumar PV, Alam M, Sastry M, Kumar R. Bioreduction of AuCl(4)(-) Ions by the Fungus, Verticillium sp. and Surface Trapping of the Gold Nanoparticles Formed D.M. and S.S. thank the Council of Scientific and Industrial Research (CSIR), Government of India, for financial assistance. Angew Chem Int Ed Engl 2001; 40: 3585-3588. Klaus T, Joerger R, Olsson E, Granqvist CG. Silver-based crystalline nanoparticles, microbially fabricated. Proc Natl Acad Sci U S A. 1999; 96: 13611–13614. Beveridge TJ, Murray RGE. Biology to Biotechnology and Medical Applications. J. Bacteriol. 1980; 11: 11562-11567. G. Southam and T. J. Beveridge. The occurrence of sulfur and phosphorus within bacterially derived crystalline and pseudocrystalline octahedral gold formed in vitro. 1996; 60: 4369-4376. Sawle D, Salimath B, Deshpande R, Bedre MD, Prabhakar BK, Venkataraman A. Biosynthesis and stabilization of Au and Au-Ag alloy nanoparticles by fungus, Fusarium semitectum. Sci Technol Adv Mater. 2008; 9: 1-6. Khwaja SS, Azamal H. Fabrication of Metal Nanoparticles from Fungi and Metal Salts: Scope and Application. 2016; 11. Pramila K, Sushil KS. Microbes mediated synthesis of metal nanoparticles: current status and future prospects. Int J Nanomat Biostruct. 2016; 6: 1-24. Mukherjee P, Senapati S, Mandal D, Ahmad A, Khan MI, Rajiv K, Murali S. Extracellular synthesis of gold nanoparticles by the fungus Fusarium oxysporum. Chembiochem. 2002; 3: 461-463. Bhainsa KC, D'Souza SF. Extracellular biosynthesis of silver nanoparticles using the fungus Aspergillus fumigatus. Colloids and Surfaces B. 2006; 47: 160-164. Ahmad, Mukherjee P, Senapati MS, Deendayal, Islam K, Kumar M, Rajiv, Sastry, Murali. Extracellular biosynthesis of silver nanoparticles using the fungus Fusarium oxysporum. Colloids and Surfaces B. 2003; 28:313-318. Smita Z, Sulabha. Biosynthesis of gold nanoparticles by the tropical marine yeast Yarrowia lipolytica NCIM 3589. Mater Lett. 2009; 39: 1231-1234. Mukherjee P, Ahmad A, Mandal D, Senapati S, Sainkar S R, Khan M I, Parischa R, Ajayakumar P V, Alam M, Kumar R, Sastry M. Fungus-Mediated Synthesis of Silver Nanoparticles and Their Immobilization in the Mycelial Matrix: A Novel Biological Approach to Nanoparticle Synthesis. Nano Letters. 2001; 1: 515-519. Absar A, Satyajyoti S, Islam KM, Rajiv K, Ramani R, Srinivas V, Murali S. Intracellular synthesis of gold nanoparticles by a novel alkalotolerant actinomycete, Rhodococcus species. Nanotechnology. 2003; 14: 824-828. Yah CS, Simate GS, Iyuke SE. Nanoparticles toxicity and their routes of exposures. Pak J Pharm Sci 2012; 25: 477-491. Kumawat L, Jain A: Biosynthesis of nanoparticles. Int J Pharm Sci R. 2011; 2: 2781-2785. Castro-Longoria, Alfredo, Vilchis-Nestor R, Avalos-Borja MA. Biosynthesis of silver, gold and bimetallic nanoparticles using the filamentous fungus Neurospora crassa. Colloids Surf B Biointerfaces. 2011; 83: 42-48. Vigneshwaran N, Ashtaputre NM, Varadarajan PV, Nachane RP, Paralikar KM, Balasubramanya RH. Biological synthesis of silver nanoparticles using the fungus Aspergillus flavus. Mater Lett. 2007; 61: 1413-1418. Khwaja SS, Azamal Husen. Fabrication of Metal Nanoparticles from Fungi and Metal Salts: Scope and Application. Nanoscale Res Lett. 2016; 11. Wang S, Lawson R, RaY PC, Yu H. Toxic effects of gold nanoparticles on Salmonella typhimurium bacteria. Toxicity Ind. Health. 2011; 27: 547-554. Senapati S, Mandal D, Ahmad A. Fungus mediated synthesis of silver nanoparticles: a novel biological approach. Ind J Phys A. 2004; 5: 101-105. Zeinab Sheikhloo, Mojtaba Salouti, Farzad Katiraee. 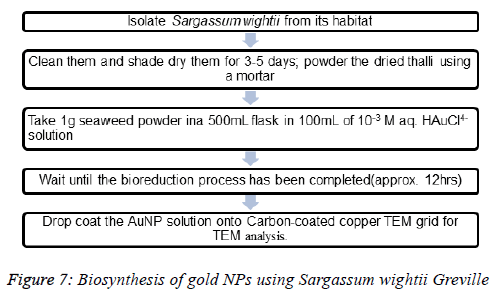 Biological Synthesis of Gold Nanoparticles by Fungus Epicoccum Nigrum. J Cluster Sci. 2011; 22: 661. Swetha Sunkar, Valli Nahciyar. Facile route to the synthesis of silver nanoparticles by the endophytic fungus Alternaria sp. Asian J Microbiol Biotechnol Environ Sci. 2013; 15: 495. Swetha Sunkar, Valli Nahciyar. Endophytic fungi mediated extracellular silver nanoparticles as effective antibacterial agents. Int J Pharma Pharmaceutical Sci. 2013; 5: 95. Buchanan RE, Gibbons NE. Bergey’s Manual of Systemic Bacteriology, 9th ed., Williams and Wilkins Co., 1984: 141–199. Sabella S, Galeone A, Vecchio G, Cingolani R, Pompa PP. Aunps are toxic in vitro and in vivo: a review. J Nanosci Lett. 2011; 1: 145-165. Maggy FL, Michael EF, Gordon Southam. Biosynthesis of Silver Nanoparticles by Filamentous Cyanobacteria from a Silver (I) Nitrate Complex. 2007; 23: 2694-2699. Yum K, Wang N, Yu M. Nanoneedle: a multifunctional tool for biological studies in living cells. Nanoscale 2010; 2: 363-372. Cruickshan R, Duguid JP, Marmion BP, Swain RHA. Medical Microbiology, the Practice of Medical Microbiology. 1975; 2: 170–189. Edelman ER, Seifert P, Groothuis A, Morss A, Bornstein D, Rogers C. Gold-coated NIR stents in porcine coronary arteries. Circulation. 2001; 103: 429-434. Senapati S, Ahmad A, Khan MI, Sastry M, Kumar R. Extracellular biosynthesis of bimetallic Au-Ag alloy nanoparticles. 2005; 1: 517-520. Simon De Corte, Tom Hennebel, Stephanie Verschuere, Claude Cuvelier, Willy Verstraete, Nico Boon, Gold nanoparticle formation using Shewanella oneidensis: a fast biosorption and slow reduction process. J Chem Technol Biotechnol. 2011; 86: 547-553. Fayaz M, Balaji K, Girilal M, Yadav R, Kalaichelvan PT, Venketesan R. Biogenic synthesis of silver nanoparticles and their synergistic effect with antibiotics: a study against gram-positive and gram-negative bacteria. 2010; 6: 103-109. Yogesh Nangia, Nishima Wangoo, Nisha Goyal, Shekhawat G, Raman Suri C. A novel bacterial isolate Stenotrophomonas maltophilia as living factory for synthesis of gold Nanoparticles. Microbial Cell Factories. 2009; 8:39. Xiangqian Li, Huizhong Xu, Zhe-Sheng Chen, Guofang Chen. Biosynthesis of Nanoparticles by Microorganisms and Their Applications. 2011; 2011: 16. Byrne HJ, Lynch I, de Jong WH, Kreyling WG, Loft S, Park MVDZ, Riediker M, Warheit D. Protocols for assessment of biological hazards of engineered nanomaterials. 2010: 1- 30.